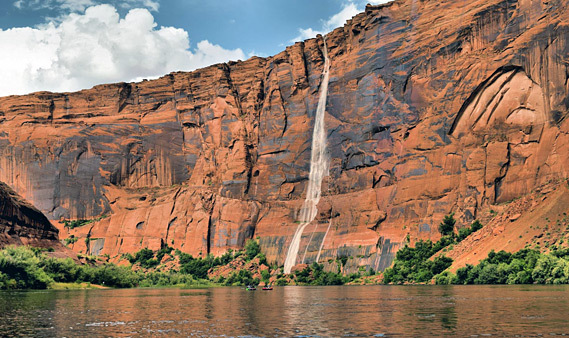 Situated close to the southwest end of Lake Powell, and two miles from the northern edge of the Navajo Indian Reservation, Page was founded in the 1950s as a town to house the thousands of construction workers building Glen Canyon Dam. Since then it thrives largely on the tourism industry and power generation. Facilities include an airport (hosting scheduled flights from Las Vegas and Phoenix, plus sight-seeing tours over the lake), a library, hospital, golf course, jeep and boat rental outfits, several museums, and a decent selection of hotels, restaurants and supermarkets. The dam itself is a few miles from the town, across a deep, narrow river gorge - the only remaining section of Glen Canyon, which continues southwards in its original state 15 miles to Lees Ferry where the cliffs open out temporarily before closing in once more at the start of the Grand Canyon. Both dam and town are surrounded by vast areas of red sand and slickrock, with hardly any grass, bushes or trees. 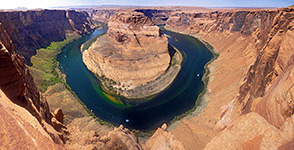 There is a popular overlook of Glen Canyon a few miles south of Page at Horseshoe Bend, reached by a half mile hike from US 89; apart from this, about the only recognized viewpoint is at the end of the Spencer Trail starting at Lees Ferry. Descriptions and location map for the main hotels in Page. 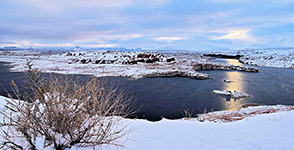 Leisure activities in the Page area are concentrated at the Wahweap resort on the edge of a bay a few miles north of the dam and right on the Utah-Arizona state line. 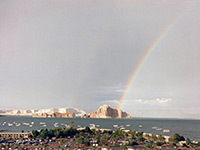 The largest marina on Lake Powell is found here, together with several campsites, a popular, spacious RV park (252 sites), a lodge, restaurant, 2 gift shops, fishing sites, picnic areas and sandy beaches. There are several places where the shore is smooth slickrock, with beautiful clear pools and deep channels ideal for swimming and diving. A couple of miles north of Wahweap is Lone Rock Road, which leads to a beach on which overnight camping is possible for a fee, but in summer this place tends to be overcrowded and not particularly inviting. Camping for no charge is possible on several side tracks west of the highway, such as one starting 1.7 miles south of the AZ/UT boundary. 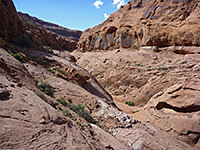 The lake has several interesting and easily accessible tributary canyons hereabouts, including Blue Pool Wash, Stateline Canyon and Jacobs Tanks Draw, though anywhere on the shoreline near Wahweap is quite scenic and relatively easily reached. 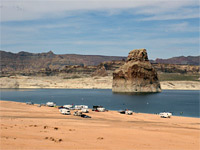 About a mile south of the marina along US 89, a short road leads to a viewpoint on top of a small hill, with a full 360 degree panoramic view - over Page, the lake and the resort, with a backdrop of steep cliffs and submerged pinnacles at one side, and the distant plateau of the Paria Canyon-Vermilion Cliffs Wilderness Area to the other. Even the distinctive smoking spires of the Navajo Power Generating Plant, 10 miles southeast, seem at home amid the red rock landscape. Seven miles north of the state boundary at the village of Big Water is the turn-off for the Smoky Mountain Road, a long, unpaved, cross-country route that follows close to the shoreline for several miles then turns northwards, eventually reaching Escalante. The soft red Navajo sandstone rocks near Page harbor several of the most beautiful slot canyons in the Southwest. World famous Antelope Canyon is located a few miles southeast of town along AZ 98, although it is has now become a rather expensive place to visit. Equally good is Water Holes Canyon, entrance to which is alongside US 89. Many other narrow, colorful ravines cut through the rocks east of town, all tributaries of Navajo or Kaibito Creeks, though the local Navajo have closed most of this area to hikers owing to past problems where unauthorized visitors got into trouble and had to be rescued. 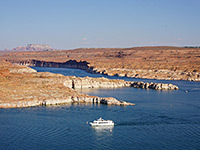 Guided boat tours are available from Page to another local attraction, Rainbow Bridge National Monument. This protects the largest natural bridge in the world, which before the construction of the dam was virtually inaccessible, and six miles from the river, but is now just above the lake shoreline and can be reached after several hours sailing. Land access is on foot or horseback along a 7 mile unmaintained trail starting from Rainbow Lodge. This in turn is only reached by a 30 mile dirt road crossing the Shonto Plateau in remote northeast Arizona, through the Navajo Reservation.